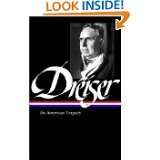 This is a study guide for the book An American Tragedy written by Theodore Dreiser. The ambitious but immature Clyde Griffiths, raised by poor and devoutly religious parents who force him to participate in their street missionary work, is anxious to achieve better things. His troubles begin when he takes a job as a bellboy at a local hotel. The boys he meets are much more sophisticated than he, and they introduce Clyde to the world of alcohol and prostitution. Please click on the literary analysis category you wish to be displayed.